Discriminating Taste | "Northern Crossings"
I was reading outside on my patio last night after the sun went down. The light from the iPad denied me the ability to see around the yard without some sight adjustment, but I noticed that there was something that was whizzing by me at regular intervals. Shutting off the machine and watching for awhile I noticed that the flowers were literally “abuzz” with what I first believed were hummingbirds. I knew that usually they don’t hum in the dark so I took some pictures. 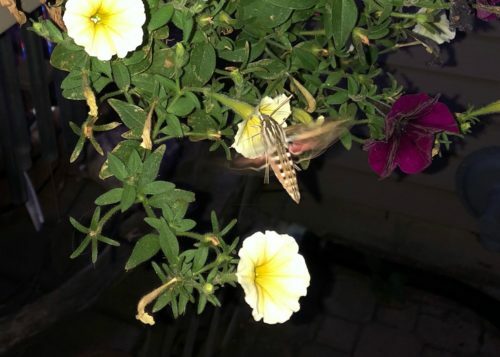 These are moths that fly like the hummingbirds and drink nectar from the flowers the same way. 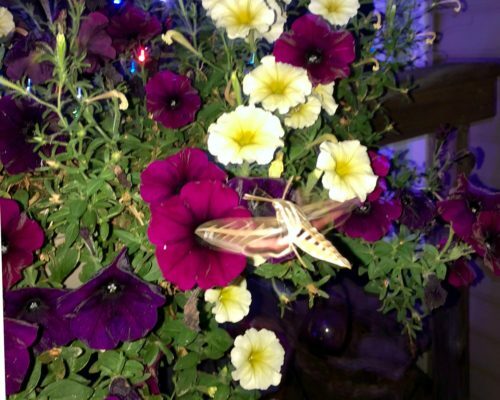 I haven’t had a chance to study up on them but I called them hummingbird moths and a quick glance at some sites confirmed that. They are also called “hawk moths”, and “sphinx moths”. I counted at least 7 of them around my patio chair and found them pretty fascinating. Evidently they are relatively common but many people don’t see them or realize they are around unless they hang on a screened door. Like a lot of other things we dance through life without a clue of the amazing stuff that is around us. Luther talked about the new creation in Christ and the dawning of the light of Justification on the sinner and opined that it should make them look at the whole creation in a new light. He even talked about the miracle of something as simple as a “peach pit” and all the potentialities that exist in something that seems so dead and “gross”. These amazing little creatures that I watched last night exhibit industry and a sense of a discriminating taste. They only went to the beautiful flowers.